SALES POLICY: An item may be returnd for refund within ten days if not as described. Vintage signed 7.75 cased crystal stems in the Cerdagne pattern from Cristallerie Saint Louis. Seldom used, each is in excellent condition. 3"x4"x4" of fine frosted crystal in excellent condition with no chips or scratches. 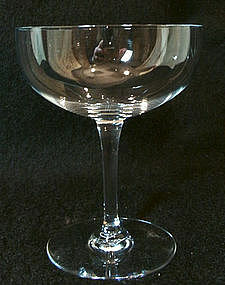 A set of four Baccarat crystal saucer champagne glasses in the Perfection pattern measuring 4.75" in height and 3.625" in diameter at the rim. 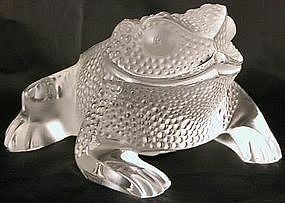 Each stem bears the acid etched Baccarat signature and is in mint condition.